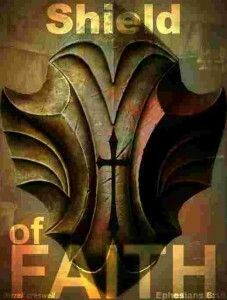 Continuing with our series, The Armor of God, next is the shield of faith. And today’s post is gonna be a little different. Today, I’m not going to throw gems of truth at you that I’ve dug up. I won’t be setting goals to strive for. You won’t get some rousing speech to get you all pumped up for battle. Today, you get my guts on this page, even more so than usual. Faith is a tricky thing. You can have a little, or a lot. It can waver or it can stand strong. It can ebb and flow, just like the tide. You have to trust what you cannot see. Reach for what you cannot feel. Listen for what you cannot hear. Faith works much like a physical shield. It can be offensive or defensive. With it, you’re protected from various projectiles. You can use it as a weapon, smashing the enemy over the head or using it as a battering ram of sorts. It can protect you from the elements. It can also help protect your fellow warriors. It is said that Spartan mothers would hand their sons a shield before battle, and tell them to come back with it or on it. Either dead or alive, they returned a hero. If they returned without their shield, they were branded cowards who had dropped the defenses and run. Right now, my faith is pretty dinged up. There’s a hole here, a gouge over there, and most days I can’t even seem to get the thing up off the ground, let alone carry it in front of me. I can believe for the small things, sure. No problem. That’s easy. I can even have faith for others. Every other person that I pray for, I have no problem envisioning in my mind what God’s gonna do for them as I pray. But when it comes to myself and something I need? Yeah. That’s where things get jacked sideways. Case in point: I have a degenerative spine condition. Slowly, painfully, the things I love to do are slipping off my approved activities list. As bad as I would love to be healed, to have that pain go away, most days, it’s hard to believe it’s ever going to happen. I’ve seen miracles. I’ve experienced miracles. I’ve watched things happen that left no doubt there is a God above and He hears us. He answers us. So why do I have such a hard time having faith for my own healing? Maybe it’s because I’ve had this condition for years now. Maybe it’s because I’m in my own way, blocking my healing or rejecting it in some manner that I haven’t figured out yet. I know my God is bigger. I know God can do anything. I guess if I’m honest, I struggle with, “Why would He do this for me?” And those old thoughts of punishment, retribution, and getting what I deserve come crashing back into my head with shattering glass and twisted metal. Even though I know that’s not how God works. Now, why would I be telling you all of this? Aren’t I supposed to give some great revelation about faith, how to get it, how to use it? Shouldn’t I be amping you guys up for a fight and sending you out to take the enemy out at the knees? It’s not just about you. And it’s not just about me. Soldiers don’t go out on the battlefield alone, they storm the gates with their fellow warriors. Somebody’s got their six. You’ve got someone to depend on, who will carry you back home if they have to. Just like it’s easier for me to have faith for others, sometimes it’s easier for them to have faith for me. This doesn’t mean that I give up. Or that I never try to grow my faith or work on whatever it is that’s holding me back. What it does mean is that I have people surrounding me that have faith for me until I do. 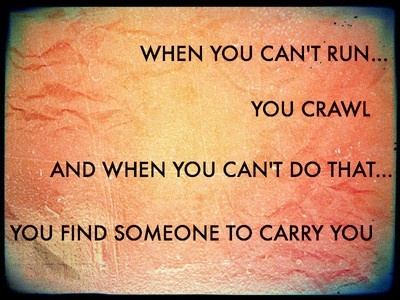 I have friends and family that will carry me when I can’t even crawl. Until I can run again. We all must seek out and surround ourselves with people who not only bolster our own faith, but have faith when we don’t. Those we can trust who have our back, no matter what. We build a circle of faith. That friends, is the strongest shield you will ever find. Have you ever lost faith, or had difficulty believing for something in your own life that you’d like to share? Or, tell us about your band of soldiers that strengthen one another. Do you lack a strong squad around you to lift you up and carry you when you need it? Contact me here, at Facebook.com/AmyBrockMcNewauthor, or at AmyMMcNew@att.net.